Shoot Basketballs NOT People uses basketball as the vehicle to save and change the lives of youth. Shoot Basketballs NOT People is a 501(c)3 non-profit organization based out of Philadelphia that YBPC partners with providing all youths that struggle with the peer pressures of conforming to negative measures as a way of life. The Shoot Basketballs NOT People initiative yearns to decrease violence that inhibits our youth of their childhood and perpetuates a cycle in which too many of today’s victims become tomorrow’s criminals. 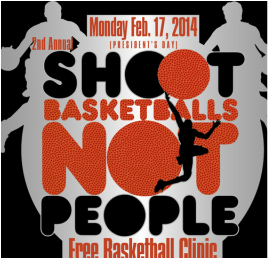 The Shoot Basketballs NOT People Free Basketball Clinic teaches the fundamentals of the basketball sport to youth ages 8 – 16 and incorporates its core objectives to help reduce gun related violence in Akron, Ohio. The design of the program is to implement strict educational and life skills to help ensure that the player focuses on success in a self-sustaining career. The coaches and staff will serve as role models to the players, providing a positive influence that promotes education as part of achieving success while adamantly advocating non-violence. By incorporating a mentorship program, players will be surrounded by positive and influential adults who propose opportunities that discourage crime and assist with the accomplishment of producing productive members of society. This free Financial Aid Workshop is an opportunity to receive information on completing your Free Application For Federal Student Aid (FAFSA). The event is open to all high school seniors and parents in Summit County. The "Turn Up The Pink" Breast Cancer Awareness Breakfast is held annually during the third weekend of October. The event includes breakfast and a panel discussion of breast cancer survivors, victims, medical experts, family and friends. All proceeds raised from this event will be donated to the American Cancer Society to help assist breast cancer research.